Government contracting is worth trillions of dollars a year. We open up public contracting through disclosure, data and engagement so that the huge sums of money involved are spent honestly, fairly, and effectively. We work across sectors and along the whole process of government contracting to use the power of open data to save governments money and time, deliver better goods and services for citizens, prevent corruption, and to create a better business environment for all. Advocacy that challenges vested interests and changes the global norm in public contracting from closed to open. Support for a network of partners who implement open contracting projects and the adoption of the Open Contracting Data Standard. Where necessary, we’ll be leading specific demonstration projects ourselves. Learning how and why open contracting works and gathering compelling evidence of what open contracting can achieve. A bold shift in the global default of public contracting and procurement from closed to open is possible. In our strategy, we lay out how we are driving that transformation. But we can’t do this alone. This is why we look forward to working and engaging with partners globally. Join us at the the cutting edge of open government and help find out where the money and the power are. The Open Contracting Partnership emerged from an enthusiastic community of policy experts, leaders and campaigners who believe that better open data and more community engagement can transform public projects, goods and services. Our vision, structure, and approach are drawn from a collaborative process that included hundreds of stakeholders across government, business, and civil society. Where it all started. 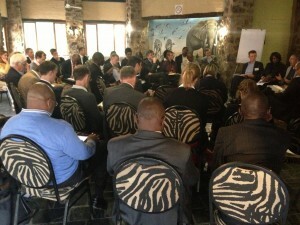 October 2012 at the first global open contracting meeting in Johannesburg, South Africa. We kicked off the Open Contracting Partnership at a design meeting in 2012, forming an alliance to foster collaboration, innovation and collective action. The World Bank Group served as our host until the end of 2014. At the first global open contracting meeting in Johannesburg, South Africa, over 150 global and local participants co-created a work plan and a set of global principles that framed our common understanding of open contracting. This work led to a year-long process resulting in the Open Contracting Data Standard in 2014, a global non-proprietary standard structured to reflect the complete contracting cycle. The standard enables users and partners around the world to publish shareable, reusable, machine readable data, to join that data with their own information, and to build tools to analyze or share that data. With the appointment of our first Executive Director Gavin Hayman in 2015, we were spun out of the World Bank to become an independent program based at our fiscal sponsor the Fund for the City of New York. We are a lean organization and governed by an independent Advisory Board, made up of renowned individuals from government, the private sector, civil society, the technology sector and development organizations. The vision and practices of open contracting are taking root and the first countries have begun to publish open contracting data. Openness is more than a means to an end. We see openness as a value beyond open data, beyond just transparency about what we are doing and why we are doing it. It’s about being open to ideas, new alliances, to diversity, to sharing, to taking chances and to new ways to solve problems. We can only achieve a global tipping point on contracting if others join in our agenda. It also about being honest and accountable in what we do and how we do it. We will remain open, continue to listen, and lead where our leadership is needed. To reach these ambitious goals, we have to be bold. Speaking truth to power requires it. We will make sure we have the expertise to back up boldness with evidence. Boldness is being steadfast and courageous without being insensitive or inflexible. We make choices and take chances. We report on them. We run with our winners, learn from our mistakes, share that learning in turn. To influence vested interests and change the status quo, we have to be creative. We have to find and elevate new approaches. We have to allow for testing, failure and adaptation. Be continually curious about new people and partners. Procurement is a dull issue, so to shift people’s perspective we must inspire others with our own curiosity, our own excitement about the possibility of change. Finally, we hope to do this in a fun way. To celebrate our successes and our partners’ successes. We are passionate about our work, and we enjoy it. It’s a long road to strategic global change and the journey is better with a sense of humour. A lever. We link up and leverage global transparency efforts and design interventions that support existing processes rather than creating new ones. A silo-buster. We bring our unique expertise to other organisations, adding value to their existing efforts to follow the money from governments to citizens. Data-focused. We use the power of data to expose, understand, and fix problems in contracting, with an open data standard at the heart of our work. Business-savvy. We can do something with business, rather than to business and help create a level playing field for business trying to win government contracts. User-friendly. We can make contracting accessible and interesting; we can be technically sound without sounding technical. Multi-stakeholder in spirit but not in structure. We have a multi-stakeholder board, we are multi-stakeholder in approach, but we don’t have formalised constituencies. A learning organisation. Learning and evidence are at the heart of everything we do and reinforces our other activities.